Soup is known as the ultimate comfort food, but everyone knows the backbone to a good soup is a good broth and broth can provide a lot more than comfort. Has your physician at Grain Integrative Health recommended bone broth when you’ve got a cold, the flu, or when you’re digestion feels off? Did you wonder if there was any truth to feeling better from your grandma’s chicken noodle soup? The answer is yes! There are numerous ways in which a simple, easy to make broth, can both speed your illness recovery and help to heal your gut. Not only does bone broth provide gelatin, electrolytes (mineral salts), and amino acids on its own, but simple additions to the cooking process can boost your immune system, fight infection, and increase liver detoxification. 1). Bones – bones themselves are made up of minerals. The cooking process of making the broth extracts the minerals. These mineral salts help keep you hydrated when you have fluid loss from sweating, diarrhea, vomiting or fever. Bone broth is a nourishing way to stay hydrated when your body doesn’t want anything more than fluids. Bones and cartilage also contain amino acids that play vital roles in the immune system, nutrient absorption, and aid the liver in detoxification. You may have heard the term “leaky gut”, which refers to the idea that the mucosal membrane is not healthy. The gelatin created by the breakdown of bones and cartilage promotes optimal stomach acid levels allowing for better digestion of large proteins in foods like meat, beans, wheat, and oats and the gelatin also helps to heal the membrane lining of the intestinal tract. 2). Vegetables – vegetables contain vitamins and antioxidants that help to build immunity and help the body to recover from oxidative stress. Green vegetables (kale, brussels sprouts, broccoli) are rich not only in Vitamin C but also in calcium. Vegetables in the allium family (onions, garlic, shallots, leeks) all contain sulfur compounds which are required for synthesis of glutathione, one of the bodies most potent antioxidants. Garlic also has great antibiotic properties and helps kick most infections. Orange vegetables (carrots, squashes, sweet potato) are rich in vitamin A which works to fight off viral infections and keep the immune system strong. 3). Herbs – Common kitchen herbs are much more medicinal than they receive credit for being. Adding ginger, thyme, rosemary, dill, curly parsley, or cilantro to a broth can dramatically increase its benefit. Thyme is not only one of my favorite flavors but is also antibacterial, helps open airways, and acts as an expectorant which means it helps to loosen mucus and make a cough more productive. Cilantro helps to detox the body from heavy metals, has strong antioxidant properties and can even help to promote better sleep. Ginger provides not only a nice gentle heat but also does wonders to help calm nausea, reduce inflammation, calm cough and fight off microbes. Turmeric is another root that is well known for its anti-inflammatory properties and is easy to add to any stock in fresh or dried form. Dill helps with respiratory infection, calms hiccups, fights infection, reduces joint aches and pain and aids in digestion to reduce symptoms of diarrhea or dysentery. 1). Bones: Bones from chicken, beef, lamb, or fish are all reasonable choices when making a broth. The rule of thumb is to use whatever is convenient and available while always trying to choose animals products that are humanely raised without the use of antibiotics and hormones. Whenever you cook a meal that has bones, try to save them in the freezer for bone broth later that week. Butcher’s also save many bones behind the counter and are happy to sell them to you. To get the most gelatin out of your broth try to get bones that have big joints (beef knuckles, marrow bones, chicken legs/feet, turkey drumsticks). If using raw bones, roasting them for 45 min to 1 hour can help to bring out their flavor but is not necessary. Adding 2-4 Tbls of an acidic vinegar can help draw more minerals out of the bones. Apple cider vinegar is great unless you are fruit intolerant. If that is the case, rice wine vinegar works well. 2). 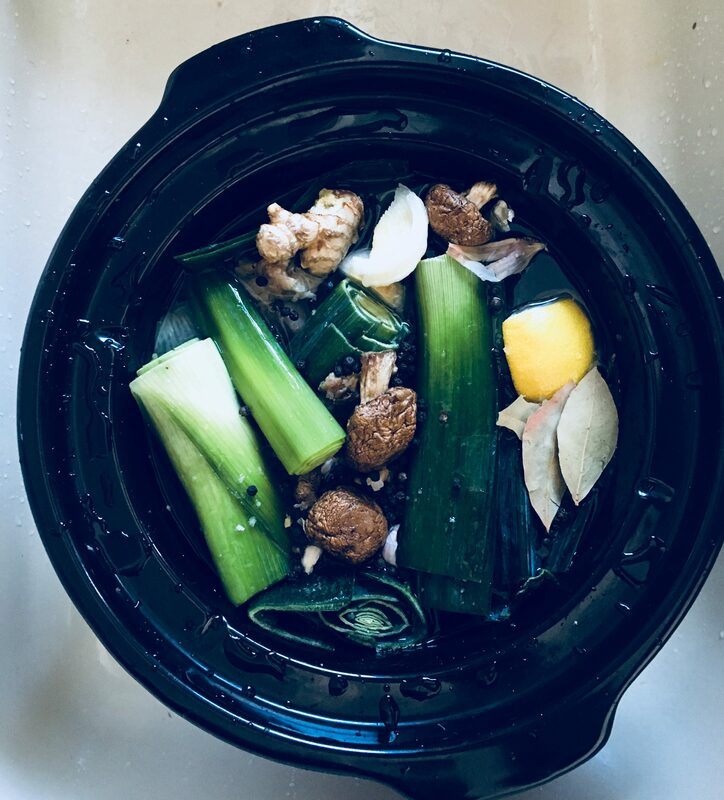 Veggies: A standard addition to any bone broth is 3 celery sticks, 5 carrots, 1 onion, and 6-10 cloves of garlic (more is better), 2 Tbls turmeric, one grocery store bunch of curly parsley and fresh dill, 10 sprigs of thyme and sea salt. In addition to this, or instead of, I often save my vegetable scraps throughout the course of the week in the same bag as my bones. Examples include onion skins, potato ends, leek tops, carrot tops, kale stems, and cabbage leaves. With broth, the more veggies the better, so feel free to add whatever is losing its bite in the crisper drawer. 3). Herbs: Just like my vegetable scraps, I save my herb stems throughout the course of a week and throw them into the broth. I always try to have at least one bunch of parsley or 10 sprigs of thyme. If you don’t have these herbs fresh, it is okay to use 1 tablespoon of each dried. I also usually have a knob of ginger (1-2 inches) laying around and throw that into the mix, roughly chopped. For additional seasoning, feel free to add 10-20 peppercorns, 2-3 Tbls of salt, and a dash of turmeric or curry powder. This step couldn’t be easier. Throw your bones, veggies, and herbs into a crock pot, a stock pot, or your instant pot and cover with water. In a crock pot set to low, let this cook together for 8-12 hours (or overnight). In a stock pot, bring water to a boil and reduce to a simmer for 3-4 hours. If using the pressure cooker setting on an instant pot, set timer for 2 hours. If you have managed the will to put this together while you are acutely ill, applaud yourself, ladle out a steaming mug and go sit on the couch and return to your Netflix binge – we will address this in a next blog. Once you have incorporated this into your weekly routine, ladle out broth into a fine mesh sieve sitting atop another pot, or a large glass measuring cup with a spout. Thank the herbs, veggies, and bones for all they’ve provided and send them to their destiny in the compost bin. Broth keeps well in the fridge for about one week. It is great to use as a base for soup, as a morning beverage, or to freeze and defrost whenever you first notice that scratch in your throat. If planning to freeze in plastic, make sure to let the broth come to room temperature before transferring to a plastic container. In addition to broth for gut repair and immune boosting, remember that individualized whole-person care is what we are really passionate about at Grain Integrative Health. Whether it is understanding the best ways to support your overall immune function, specific herbs or remedies to help you beat a cold, or getting to the bottom of your digestive disturbance, we are here to help you find your way back to health.